We departed early from the Cebu North Bus Terminal to avoid heavy traffic. As such, we arrived at Danao earlier than usual. We took a hot, heavy breakfast to fuel our bodies for the arduous journey ahead. After negotiating for a fair rate for a habal-habal ride, we were on our way to Lawaan, Danao where we left off during the first half of Segment 4. Still a long way from Lawaan on the lonely road, one of the habal-habal drivers sheepishly asked Sir Jing and Apol to disembark. It turned out that his vehicle has a malfunctioning engine, and it can’t climb the steep inclines ahead. 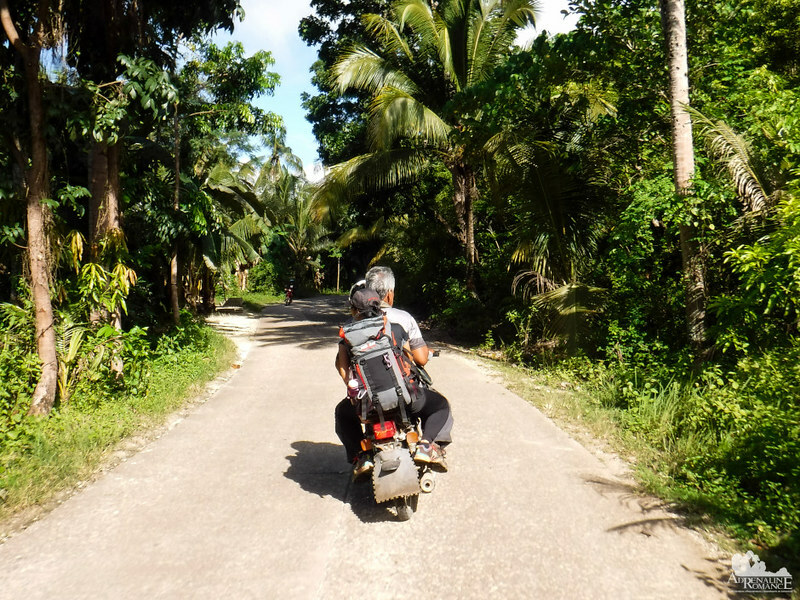 He drove back to Danao City, promising to send another habal-habal driver with a more tuned-up and powerful motorcycle to continue the journey. We had to wait for half an hour for the replacement habal-habal driver to arrive. While we waited, we exchanged stories with the remaining habal-habal driver, learning a lot of insights into Danao’s black market. Based on our itinerary, we were half an hour delayed when we reached our starting point in Lawaan. 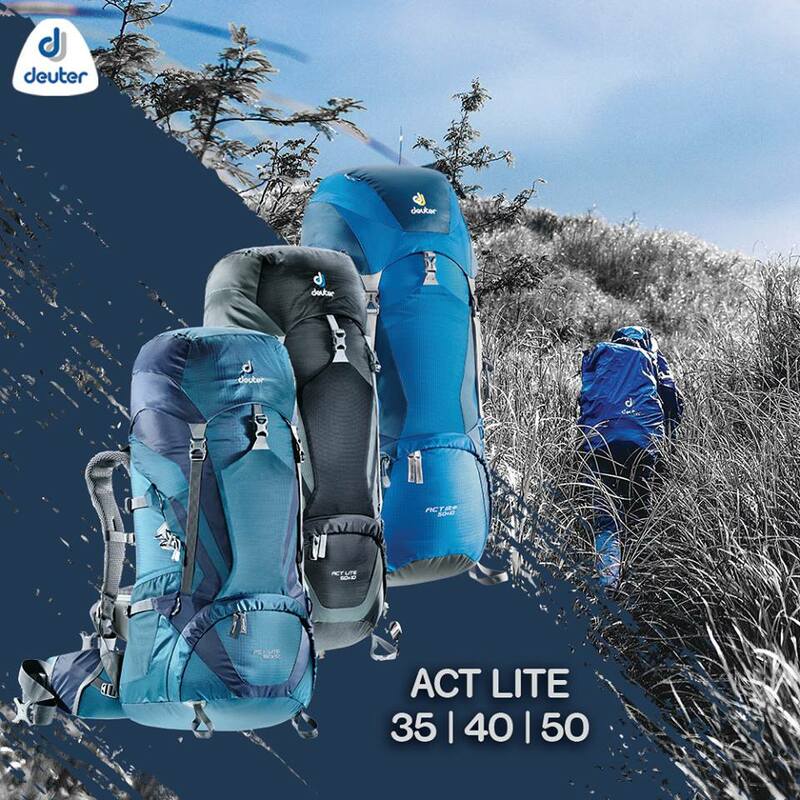 Not wanting to waste any more time, we strapped on our Deuter ACT Trails and started our trek to the municipality of Carmen. 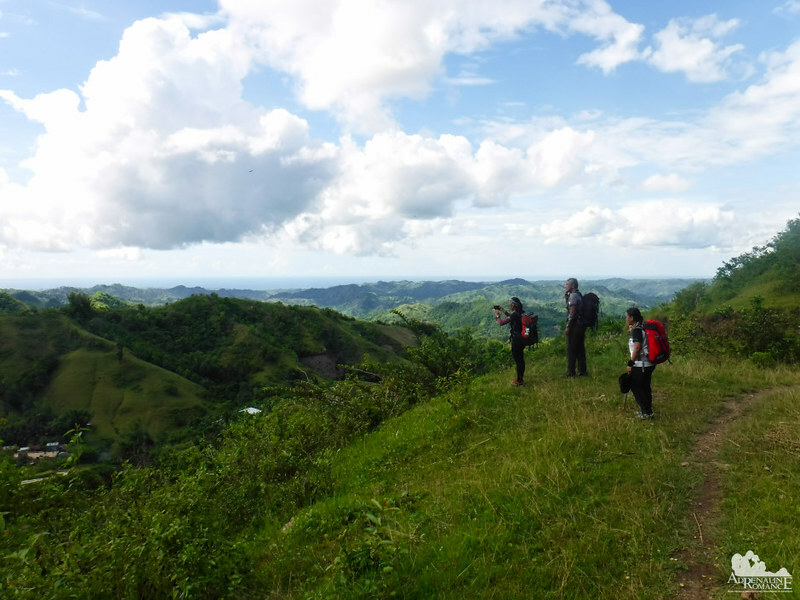 The first few kilometers of the hike greeted us with a feeling of dismay. That’s because we were walking on a concrete road. You know how we hate concrete roads. That feeling was exacerbated as we remembered the second day of our Segment 3 hike, where we walked for 30 kilometers on hard, hot, painful, uncomfortable concrete. Yet, it was still fine. That’s because everywhere in this lonely road, there are lovely scenes to take in. Walls of healthy trees, large swatches of farmland, and grassy meadows painted a vast canvas of green right before our eyes. Funny thing, however, is how locals react when they asked us where we’re going. Every person who realized that we’re walking to Carmen were shocked, answering us with a wide-eyed look or a vigorous shaking of their heads. That’s more than 30 kilometers away, and they could not imagine anyone willing to walk that distance. We believe that they think we’re just extremely thrifty or utterly foolish to do such an endeavor. “Why not ride a habal-habal?” they suggested. Why not indeed? Hahaha! 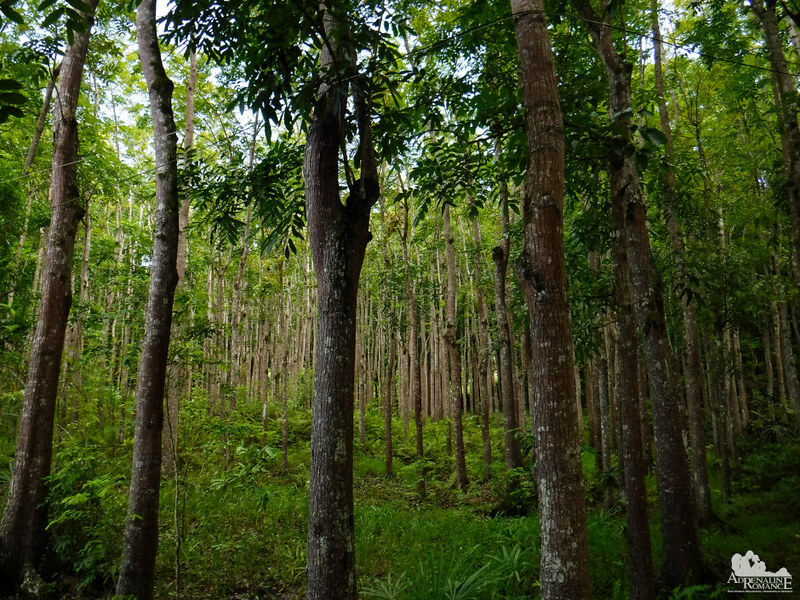 We also passed by a successful reforestation project by the Department of Environment and Natural Resources (DENR). It’s a refreshing sight. 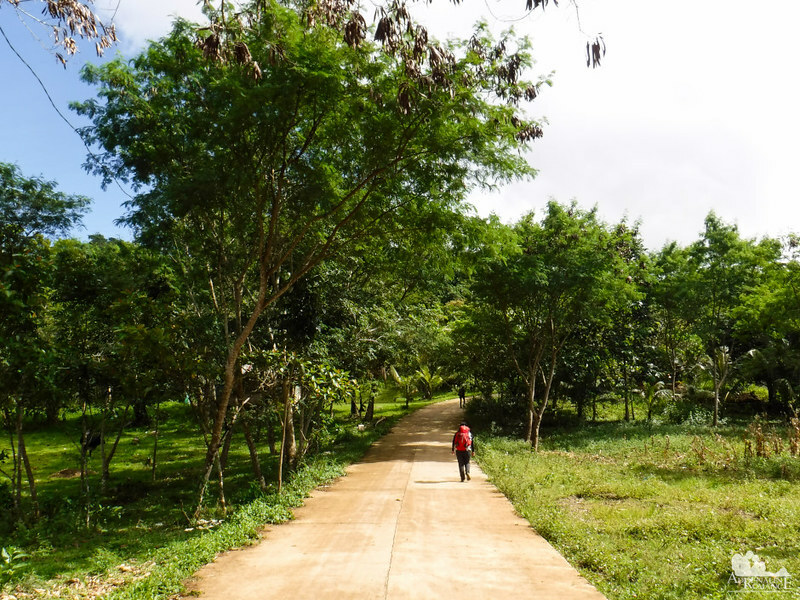 If our memory serves right, much of Cebu’s first-generation forests have been razed to the ground since the Industrial Age. 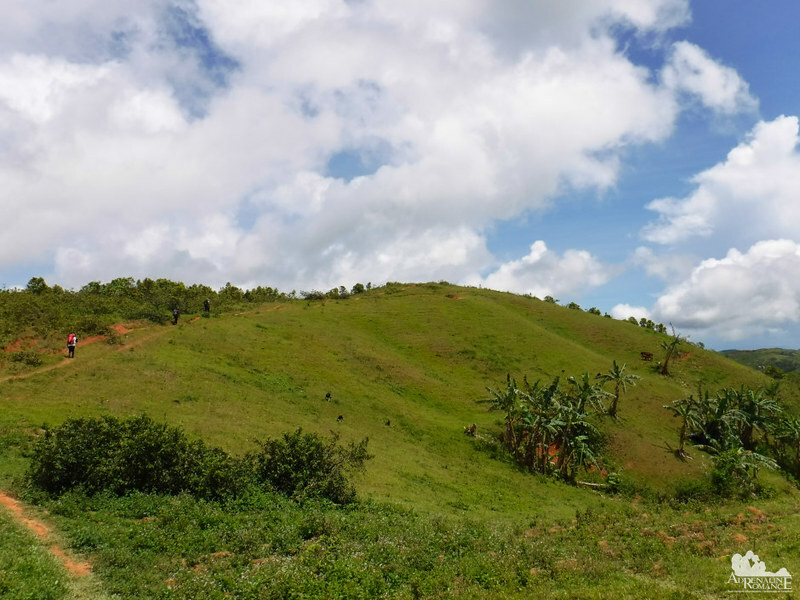 The government’s reforestation efforts are commendable, and successful projects shine like a beacon for more endeavors to protect and serve our fragile environment. As we walked farther, houses became more scattered, divided by large swaths of farmlands, grasslands, or forests. 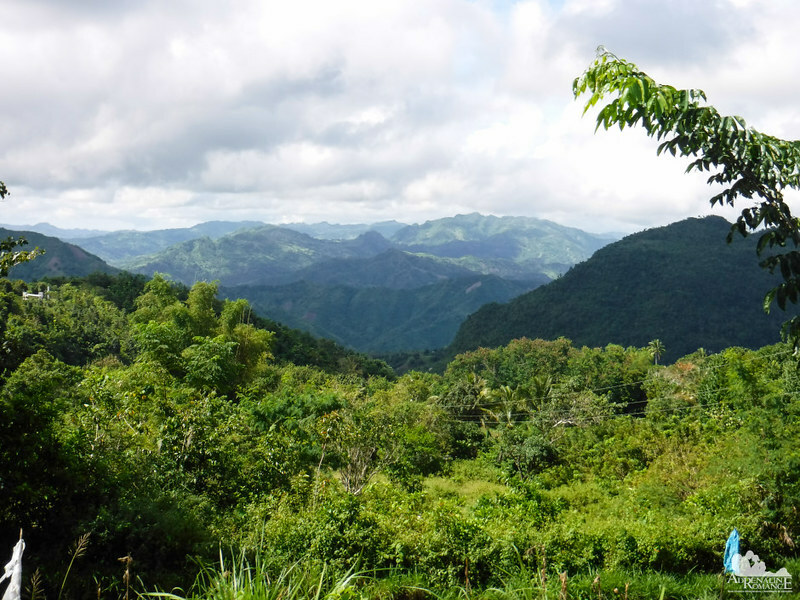 These open areas gave us stunning views of Cebu’s northern mountain ranges, which are incredibly breathtaking. Because we enjoyed fairly clear skies during this hike, we could see for miles. In fact, we could make out the faint outlines of Mt. Babag’s towers some 50 or 60 kilometers away. 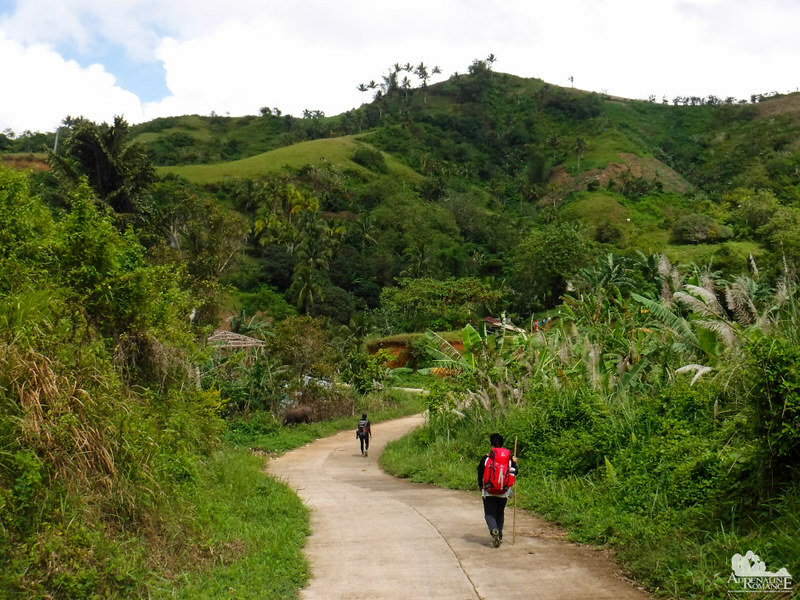 Even though this part of Danao’s highlands has a road, there is still a peaceful pastoral air as we walked here. While there are houses, we rarely saw their residents. Instead, green hills and lush plants dominated the place. If you want to melt the stress that you’ve been harboring for the week, then visiting this pocket of velvety green will take care of that easily. We took a short break at one of the few houses that line the road. We had a nice chit-chat with the owner who was tending his garden. 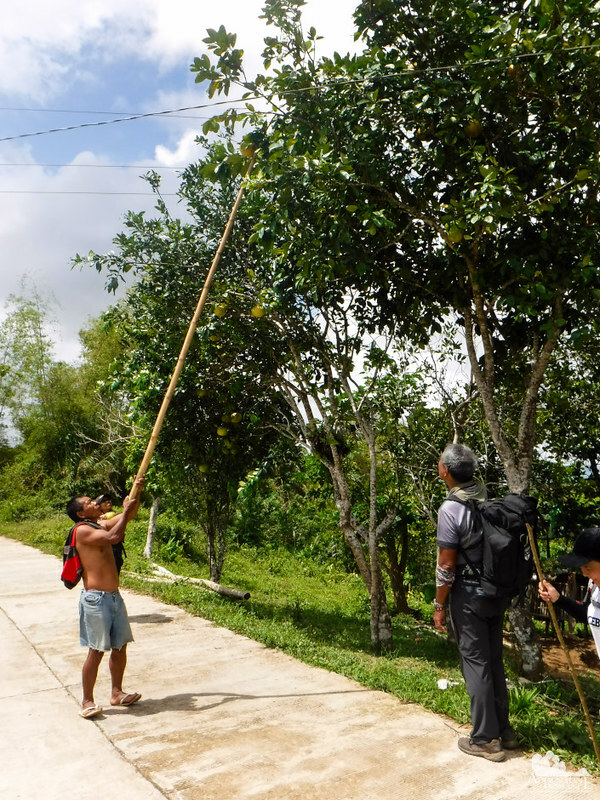 With enthusiasm, the kind dude took a long stick and offered us some ripe buongon—pomelos! Now, that is a sweet, healthy treat! And he refused any amount of payment! We love juicy pomelos. 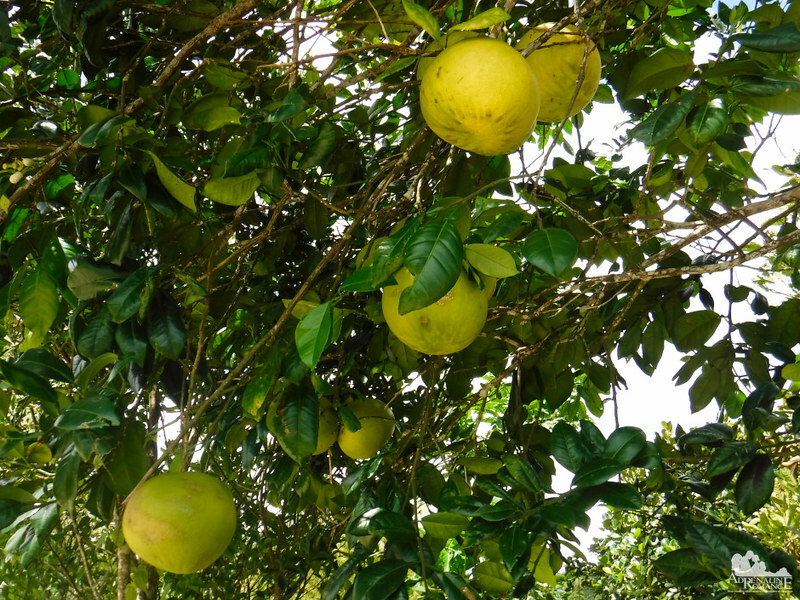 Similar in appearance to grapefruit, pomelos are a kind of citrus fruit. They are very rich in vitamins and minerals, and they had a unique taste between bitter and sweet. Dipping the fruit with a little bit of salt makes it taste so much better. The pomelo’s rind is quite thick, so you really have to wrestle and rip your way to the flesh. Yes, peeling a pomelo is an exercise! A short distance away, we stopped by a lone sari-sari store. 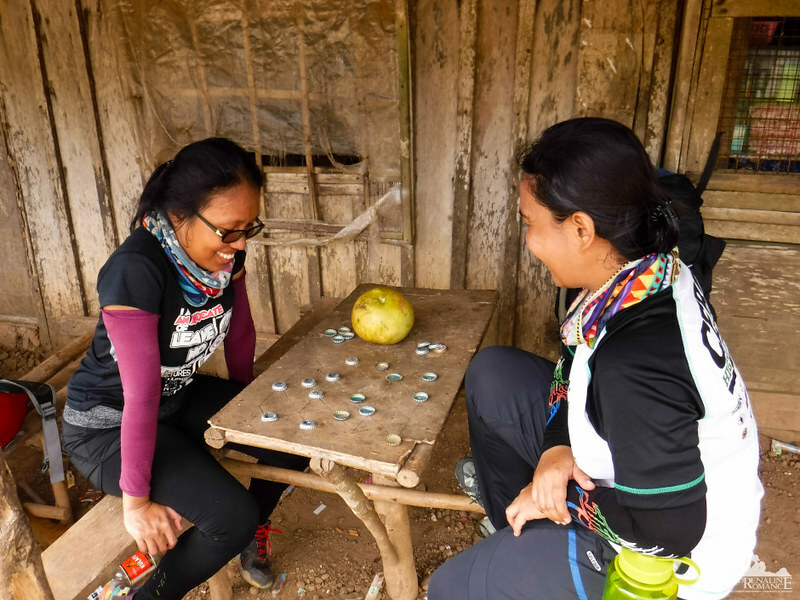 While waiting for Sir Jing to make a courtesy call to a nearby military outpost, Apol and Sweetie played a few rounds of Dama, a local version of Checkers. I don’t know who had the most wins; I was contented in snacking on some junk food. Hahahaha! Sir Jing came back after half an hour, announcing that we’re all okay for the next leg of the day’s trek. The best thing about it? We were walking on a soft dirt trail all the way to our campsite! Finally, our feet were at their home terrain. The wonderful trail wove up, around, and through the numerous hills that line all the way to Carmen. It’s hard to believe that the green velvety grass that cover the hill slopes are not manicured by lawn mowers or grass cutters. These living carpets of green are entirely natural. No wonder cows, carabaos, horses, and goats love to bask here. These hills offer plenty of food, fresh air, and sunshine. Most of the terrain here is exposed. 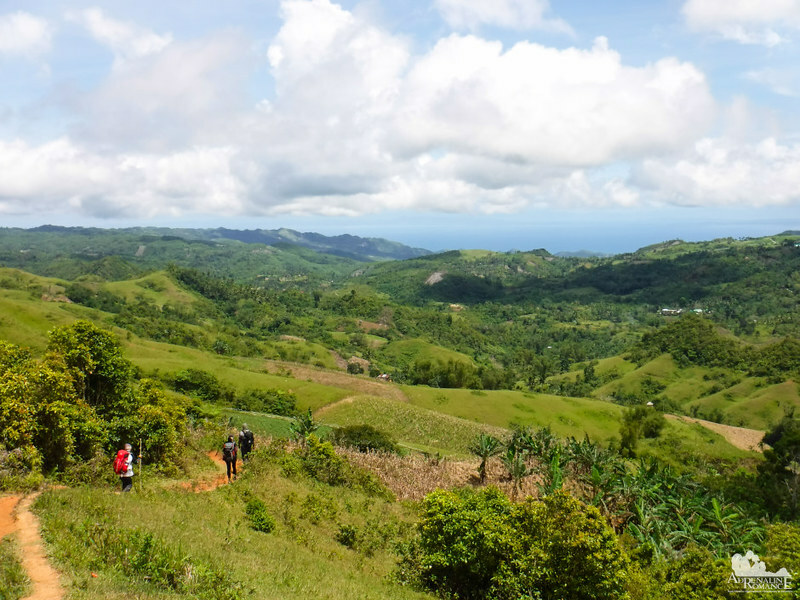 Thus, on top of high hills and open ridges, we saw the full natural glory of Northern Cebu and Tañon Strait. It’s a breathtaking checkerboard of prairies, farms, and forests, bordered by sinuous mountain ranges far away. 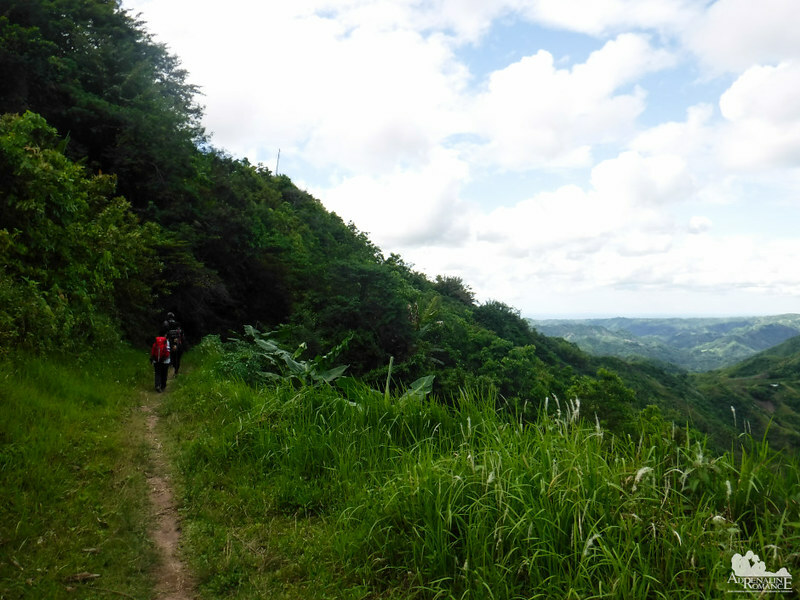 It took us a degree of effort to discover and enjoy the beauty of Northern Cebu. Just like in life, anything beautiful is worth giving it some time and effort. That is a steep ascent, isn’t it? 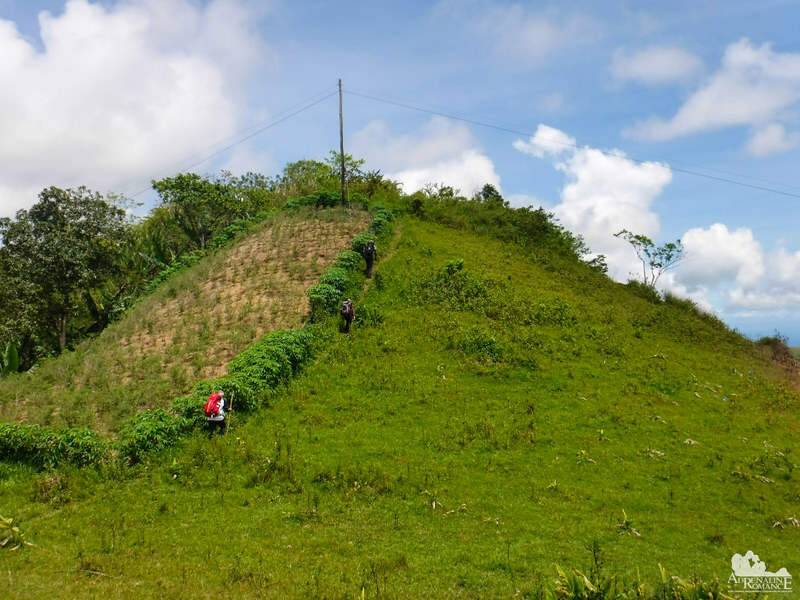 The slopes of many domed hills like are used as personal farms by locals. Which brings us to another point. We absolutely admire the resiliency, resourcefulness, and independence of people living in the highlands. Relegated in the borders of a thriving economy, these people are forced to live and thrive on their own. And they have done so in a spectacular manner. With their own hands, they cultivated vegetables, fruits, root crops, grains, and more, ensuring that have a ready supply of food. We were nearing our lunch stop—a small clearing near the summit of Mt. 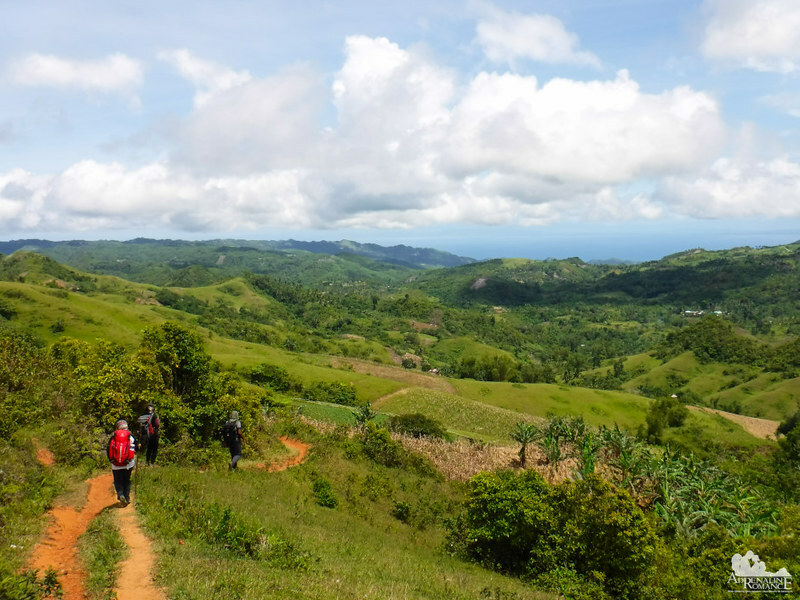 Mago, a new hiking destination that has become increasingly popular with Cebuano trekkers. But to enjoy lunch, we need to prove that we’re worthy of it. The last obstacle to our well-deserved lunch was a very steep climb up the slope of Mt. Mago. A recent dry spell made the trail loose and slippery. 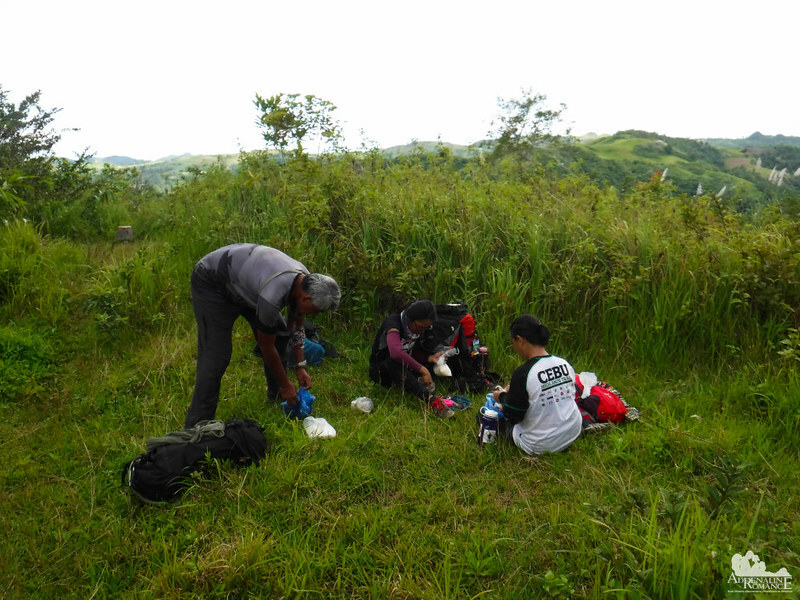 But with some perseverance, we reached our lunch site at around 12:30 PM, a grassy clearing that is partially protected by tall shrubs and cogon grass. We enjoyed a filling packed lunch of fried milkfish, fried lumpia, some veggies, and rice that we bought earlier in Danao. We heard the distant but ominous sound of rolling thunder. From where we sat, we could see dark rain clouds moving northwest from our position. In open, high-altitude terrain, being caught in a thunderstorm could be dangerous; we could be hit by lightning or buffeted by winds. Thus, we quickly finished our meal, cleaned up the site, and packed up. 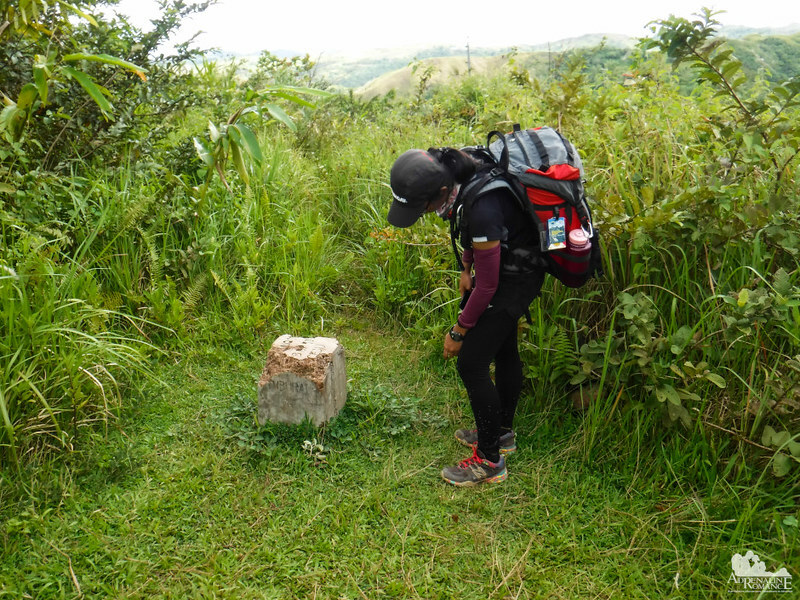 Before leaving our lunch site, we visited a dilapidated and damaged mohon, a concrete marker in the middle of nowhere. The mohon indicates the boundary between two municipalities. 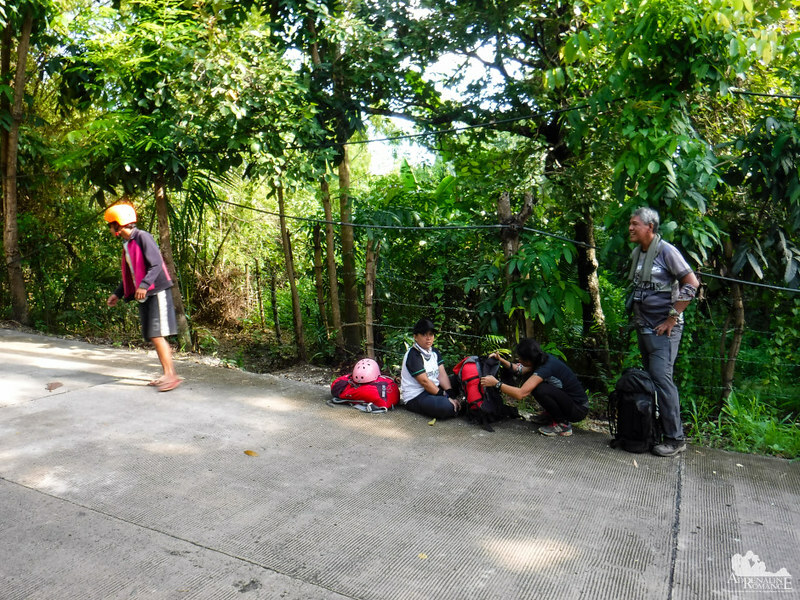 By stepping a foot past the mohon, we left Danao and entered the municipality of Tuburan. It’s a beautiful thing to look back and see how far you’ve come. When you triumph over an obstacle in life, look back and realize that you can overcome all challenges that come to you. The key is determination and willpower. 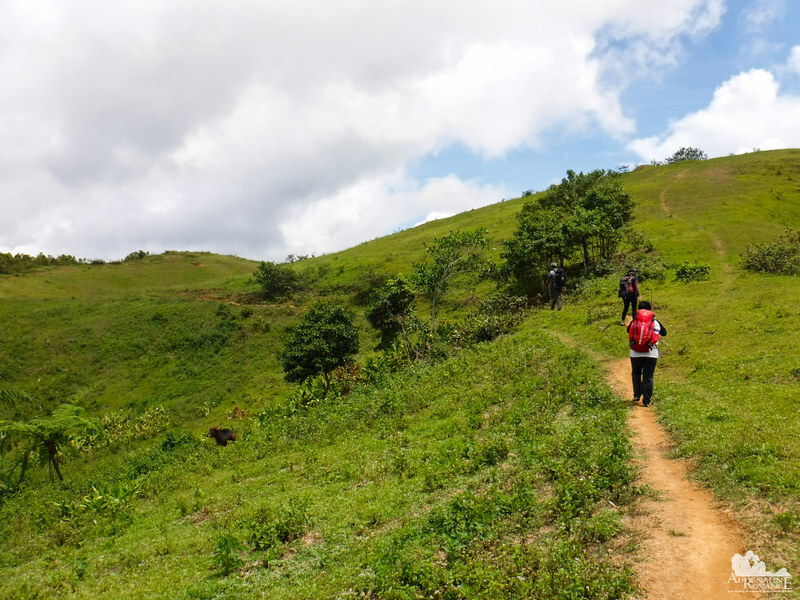 Most trekkers would turn back to the grasslands once they reach the summit of Mt. Mago. But since our campsite is in Tuburan, we pushed through inside the lush forest on the Tuburan side of Mt. Mago. 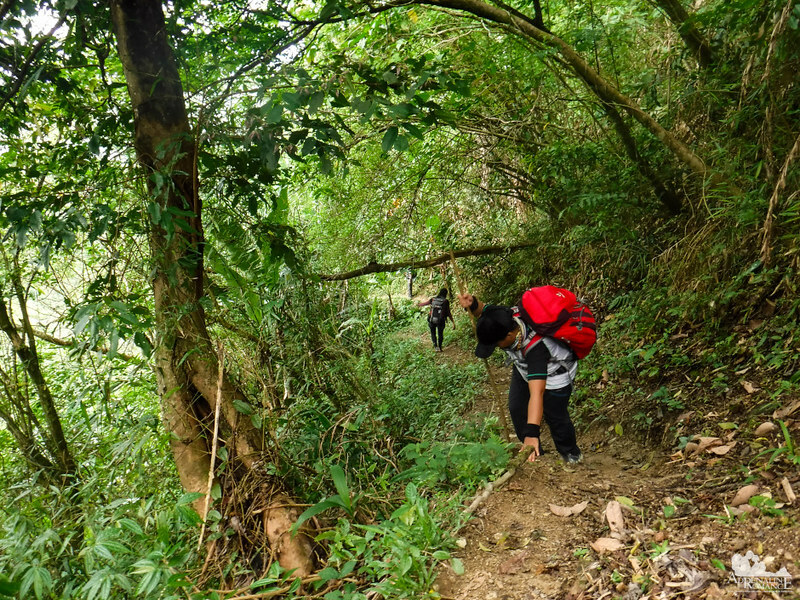 Sir Jing said that few trekkers have ever exited the mountain this way. 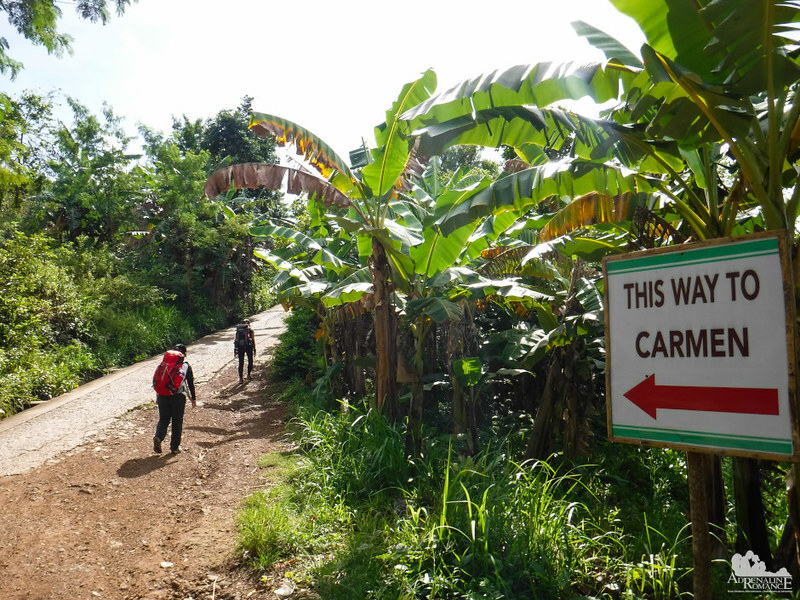 Locals, however, sometimes use this trail to cross to Danao. Rightfully so, we believe. That’s because the trail, mostly composed of slippery loose soil, is considerably steep. We had to hold on to grasses, roots, and vines to avoid sliding on our bums. We soon arrived at a ridge where we had a nice view of one of Mt. Mago’s slopes. 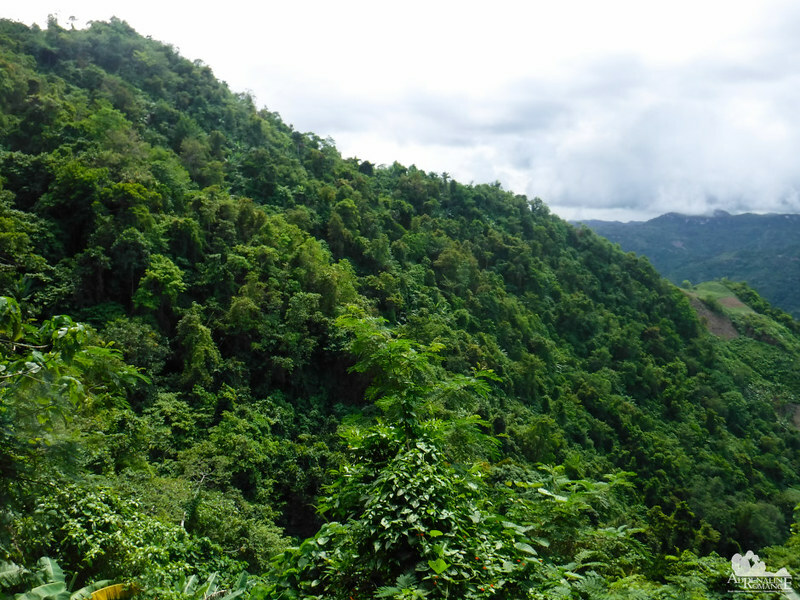 You can definitely see the first-rate forest cover—pristine and untouched. Taking this photo was quite a jittery undertaking. That’s because we were standing on a narrow trail that runs along a slope. Just in front of us, a few inches from the tips of our shoes, was a steep, sloping drop-off whose bottom we cannot see. Soon, we exited the forest and started a long, steep descent on Mt. Mago’s ridge. While the descent was not exactly difficult, it was painful for the knees. 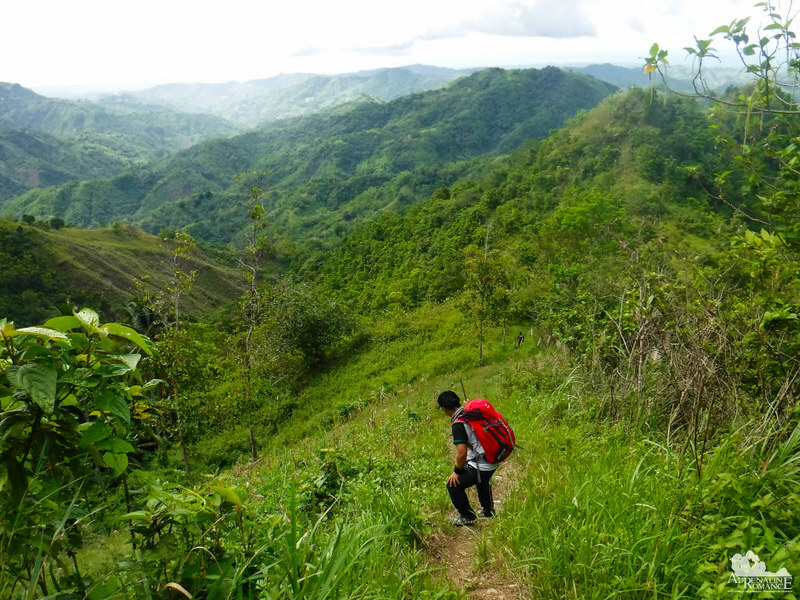 When it comes to trekking, descents are Sweetie’s mortal enemy. She usually looks out for long sticks that she could use as a trekking pole. Hmm…age has caught up to us. Perhaps it’s time for us to buy trekking poles. 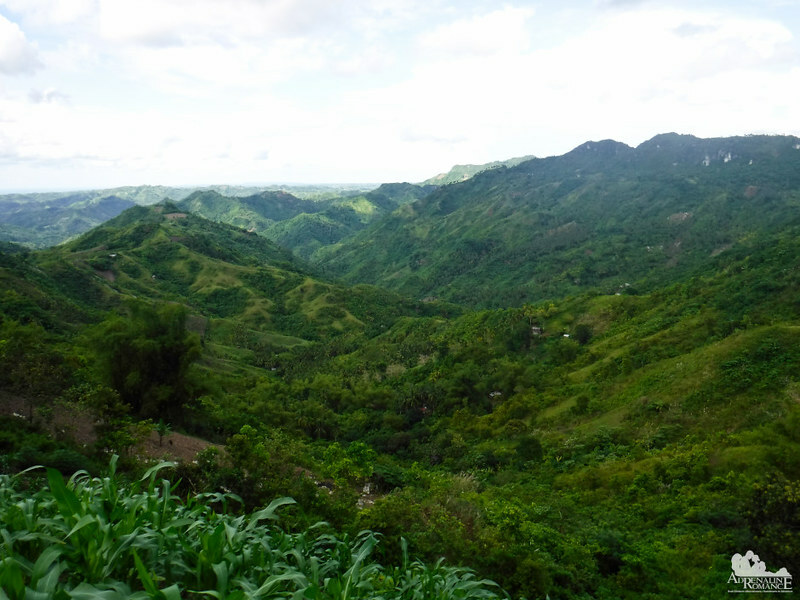 This is just a minuscule part of the vastness of Northern Cebu. A majority of these places are mysteries to those who live in the lowlands. Thus, it is a privilege for us to be able to set foot on these hidden trails and mountains. Thankfully, what followed the long descent was an easy walk on rolling terrain. Verdant scenery surrounded us every step of the way. 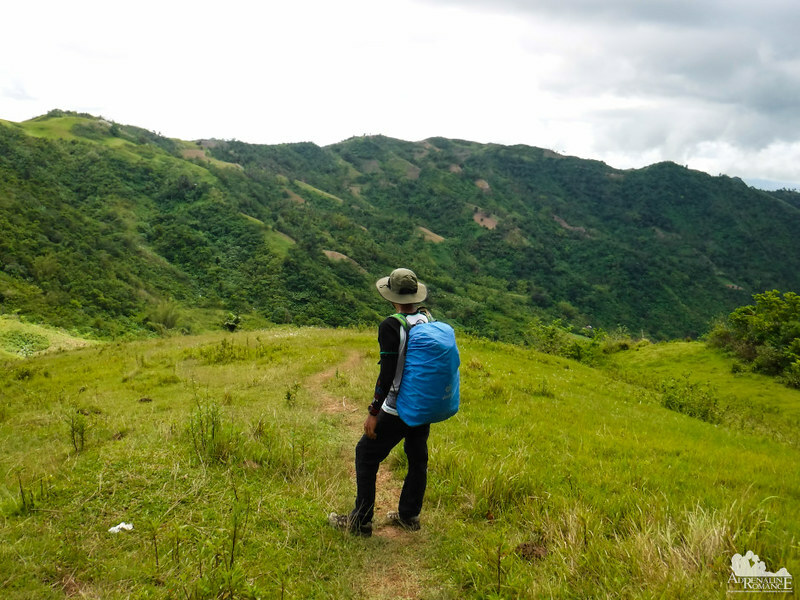 On top of an open plateau, we finally saw our campsite, a small poblacion called Bangkito. The poblacion consists of a basketball court—which doubles as a community center—surrounded by less than a dozen houses. Yes, it’s hard to believe such a community exists, considering its remoteness, difficulty of access, and small size. Being city dwellers and accustomed to modern conveniences, it’s also hard to imagine how these people can enjoy the things we consume for granted—softdrinks, sweets, electronics, etc. You’ve got to hand a huge piece of admiration to them. Right on time! 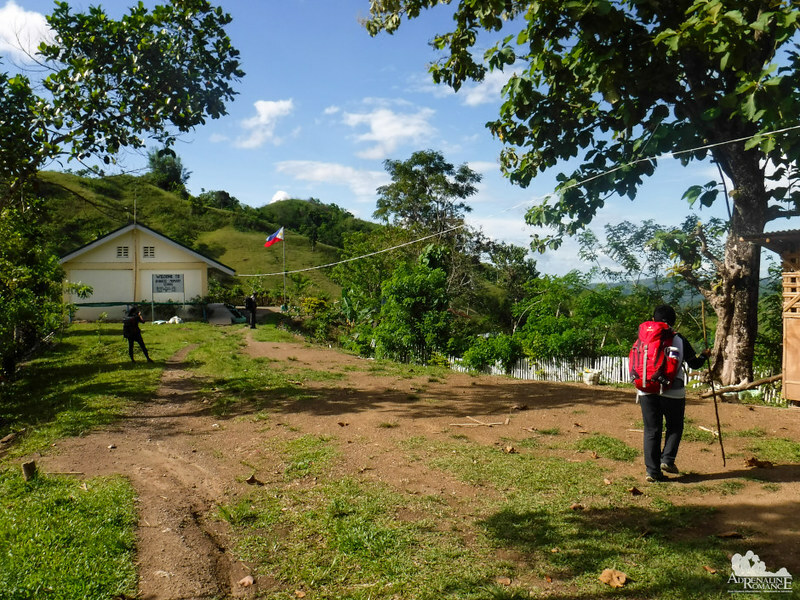 By mid-afternoon, we arrived at the Bankito Elementary School, which is also our campsite. This is the only other major structure in Bankito aside from the basketball court. We had plenty of time to set up our tents and hammocks. We pitched ours under the roof of the school’s stage, which meant that we don’t need to set up our waterproof flysheet. 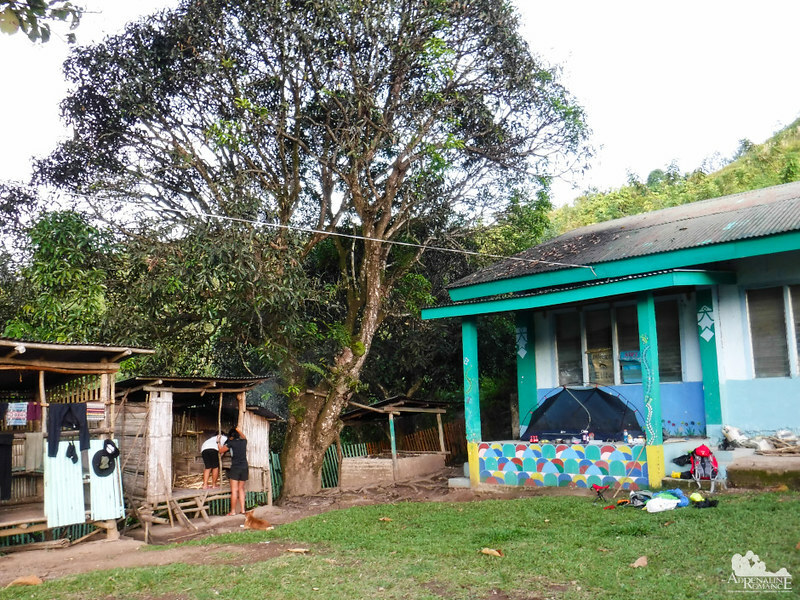 Sir Jing and Apol set their hammocks inside a very comfortable, roofed bamboo shed. A four-legged resident came over to investigate, curious at the new people. This calf has such a playful personality; he often charges and nuzzles us with his head. Although we know he’s just playing, we were quite careful. Calves are young, but they’re strong beasts and can easily injure humans. 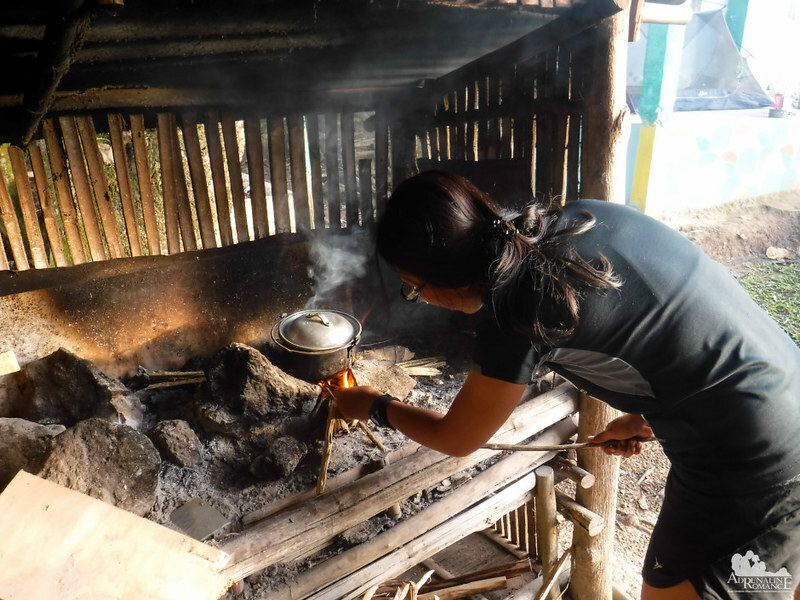 One of the nicest things about the Bankito campsite is that there is a wooden stove. We cooked rice on the stove, using bits of dry leaves and wood lying around. In the end, the rice seemed to taste better. The school has a water tank, which means that our camp has a dependable water source. 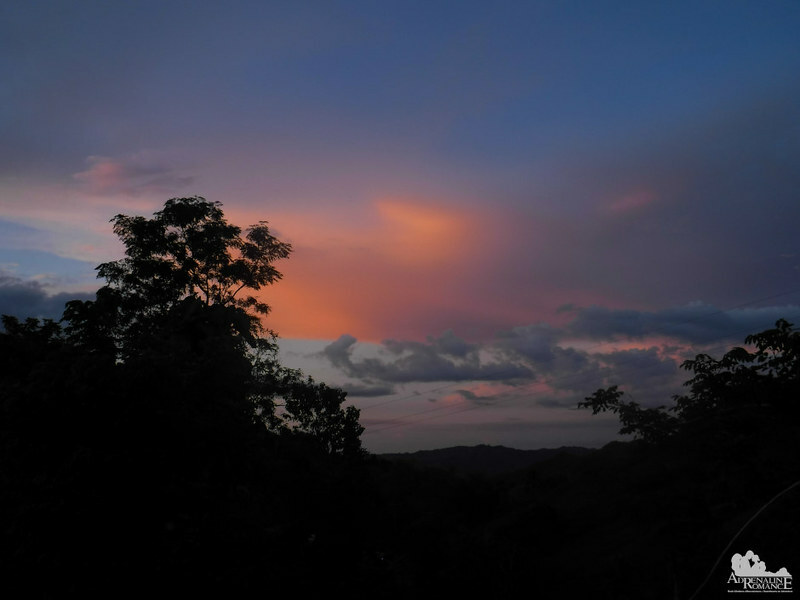 Before we ate our dinner, we gazed upon a dazzling crimson sunset that showered the landscape with a soft orange glow. We live for moments like this. Before we end this blog post, we would like to add that we bought a couple of special things. One, we love coffee. Real coffee! Not those powdered 3-in-1 sachets. We brought and brewed real ground coffee from Benguet. A hot cup of real Benguet coffee in the afternoon was absolutely bliss. Two, we also brought high-quality lemon and ginger tea from Metolius Artisan Tea. This is not your ordinary Lipton in a tea bag; this is real high-quality loose leaf tea! We brewed a few hot cups after dinner. Let me tell you: we had the best shut-eye! The gorgeous scenery continues on the fourth and last day of our Segment 4 hike! Watch out for Part 2! Hi Halden! It’s from Lawaan, Danao to Bankito, Tuburan. 🙂 The next day (and the next blog) was from Bankito, Tuburan to Caurasan, Carmen. Mountains.. beautiful as ever! I’m drafting my post about our last weekend’s failed attempt of reaching Mago from Lawaan via Magtagobtob right now. We were also asked “nganong naglakaw raman mo?” by locals whom we asked for directions. Hi Ace and Demi! Thank you for your kind words. What an epic trip it is. 30 km, green hills, juicy pomelos, breathtaking checkerboard, lunch at a grassy site- ahh lovely. An itinerary that is inspiring me. Hi Riya! Indeed! In fact, as far as our experience is concerned, Segment 4 is probably the best and most scenic segment in the CHT. I’d love to try a pomelo. I’ve had mangoes from Cebu before, and they were amazing! Hi Sage! How did you find the mangoes in Cebu? You should also visit Guimaras; we have a blog about the place. They have heavenly mangoes as well. Pomelos are delightfully bitter, sweet, and citrus at the same time, especially if they’re ripe. That’s awesome that you got to try a ripe buongon (pomelo). It is so nice that a local got one for you, I love experiences like that! Hi Fearless Foreigner! Indeed. In the highlands, locals are actually very friendly…and shy. You must have heard in the media how Filipinos are so warm, friendly, filled with hospitality, etc. Those traits are exemplified by highlanders and rural folks rather than city folks. What a wonderful travelogue! Your post makes me write more about my trip to Andaman and Nicobar islands. I would love to gaze at the crimson sunset while playing the Dama. It’s adventures like yours that make up a real trip! It’s so funny how locals reacted when they realized you were about to walk for 30 km! Beautiful story and beautiful pictures! What a fantastic way to close your post with such an incredible sunset. And what a great achievement you made after such a long walk. I am so impressed by this story and you should very proud of yourself. Hi Federica! Thank you very much for your kind words. 🙂 Walking the CHT has always been our dream. 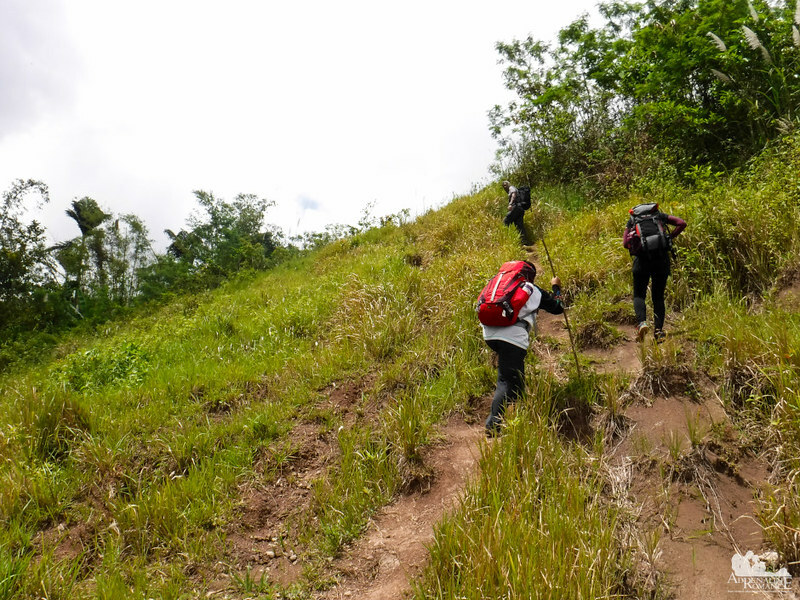 How brave to trek through Tuburan and beyond! The scenery is totally unbeatable, thank you for writing this guide so eloquently – definitely will save for future travels! Hi Tayara Muse! Thank you! Trekking here is a bit tricky as the people are still traumatized during the time when rebels and raiders infested this area. You would need Sir Jing as your guide since he knows the officials here. That’s a good start for 2019! Love your new escape to the nature. 🙂 I personally travel mostly to cities, because I have enough nature in Finland.